SSMC Program Offers Fun, Friends, and a Quality Music Education! 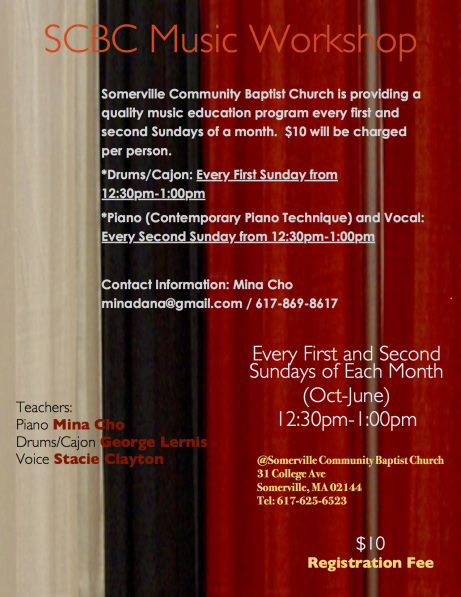 Somerville, MA – The enjoyable sounds and groovy vibrations of music will fill the air of summer at Somerville Community Baptist Church (SCBC) on August 18, as the first day of SCBC Summer Music Camp (SSMC) begins. The program provides a variety of fun creatively mingled with various musical activities for children from 7 to 16. Registration is now open until July 18 for students looking to explore exciting opportunities to experience music, build up their performance skills, create their own music, interact with friends and professional music teachers in an ensemble and a private lesson setting, have opportunities to perform, and many more! This year the camp program will feature the theme “Make Your Groove” through learning 1) various songs from Broadway musicals and Disney movies and 2) African rhythms, Hip-hop & break dancing, and Pop/Rock/Gospel/Blues grooves. Produced by the Music Department of SCBC, the program runs from 9:00am – 4:00pm, Monday through Friday from August 18 – August 22, 2014. Camp is held at Somerville Community Baptist Church located at 31 College Ave, Somerville, MA 02144 (Reachable by MBTA: Davis Square, Red Line). This year’s camp director is Mina Cho, Director of Contemporary Music of SCBC and Doctor of Musical Arts in Jazz Studies Candidate at New England Conservatory of Music – www.minachojazz.com. *A limited number of scholarships are available for students. SCBC will continue to provide children in the community with a fun and inspiring musical environment to grow and learn through many other community engagement and outreach programs. Please visit us at www.ilovescbc.org. (October - June) from 12:30pm-1:00pm. No music workshop in July, August, and September. Please visit www.ilovescbc.org for more information.